We are honored to announce that we were selected to create a period representative chandelier for the living room of the Ohio Governor’s Residence in Bexley, Ohio. 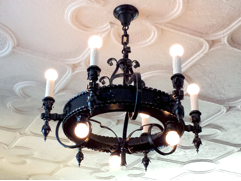 After a prolonged search for a site appropriate fixture for the room the Friends of the Ohio Governor’s Residence and Heritage Gardens, with guidance from the Ohio Historical Society, chose us to create a chandelier based on a design offered by the Cincinnati Artistic Ironworks, active at the turn of the Century … but enriched with Rose Iron Works flair. We are proud to explain that First Lady and Governor Kasich specifically wished to showcase Ohio artists and craftsmen for this delightful project. Read about Construction & Read News Article.